Jacques LeBlanc, a commercial fisherman from the Bay Mills Indian Community, pulls a gill net out of the ice on eastern Lake Superior. It’s a frigid, snowy day on Lake Superior and Jacques LeBlanc is fishing where his family has for generations. He’s pulling a 300-foot gill net out of a small hole in the ice, removing fish as he goes and throwing them into a bin. LeBlanc says his catch isn’t as good as it was the other day, but he can’t complain. LeBlanc is a citizen of the Bay Mills Indian Community on the east end of Lake Superior. He’s been a commercial fisherman for 48 years. His father, "Big Abe" LeBlanc, fought for treaty fishing rights in the Michigan Supreme Court. 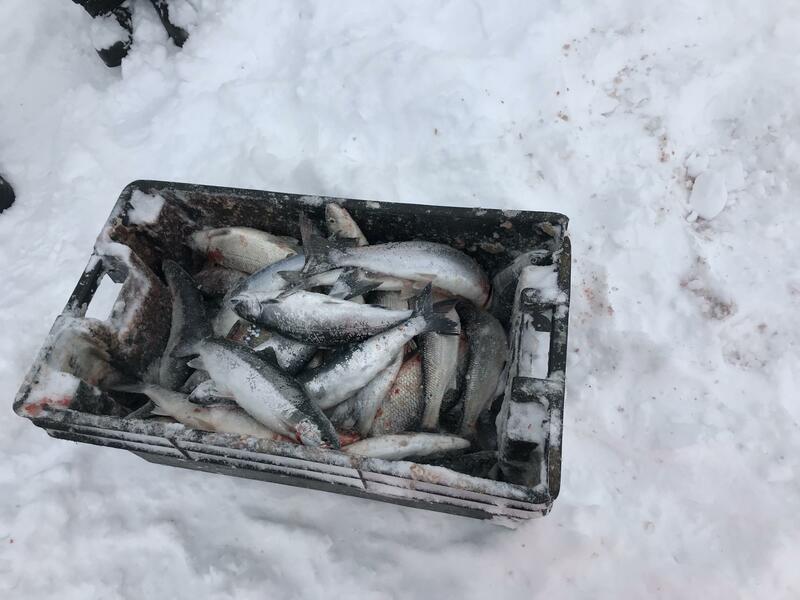 Fish, mostly herring, that Jacques LeBlanc has just retrieved from his gill net through a hole in the ice on Lake Superior. Today, he catches mostly herring with a few whitefish sprinkled in. "We go in seasons, just the way we live," he says. "Like right now we call it herring season, then in a month and a half we'll go into smelt season. We fish trapnets for whitefish all summer. There's more money in whitefish than anything for us." Whitefish are the most important commercial fish species in the Great Lakes, but they're getting harder to find. The 1836 Treaty of Washington reserves fishing rights for the Bay Mills Indian Community in parts of Lakes Michigan, Huron, and Superior. But invasive mussels have changed the food web so much that whitefish populations are starving in Lakes Michigan and Huron. That’s pushing Bay Mills fishermen to Lake Superior, the one place they still have success. This worries Paul Ripple, head of Biological Services for the Bay Mills tribe. 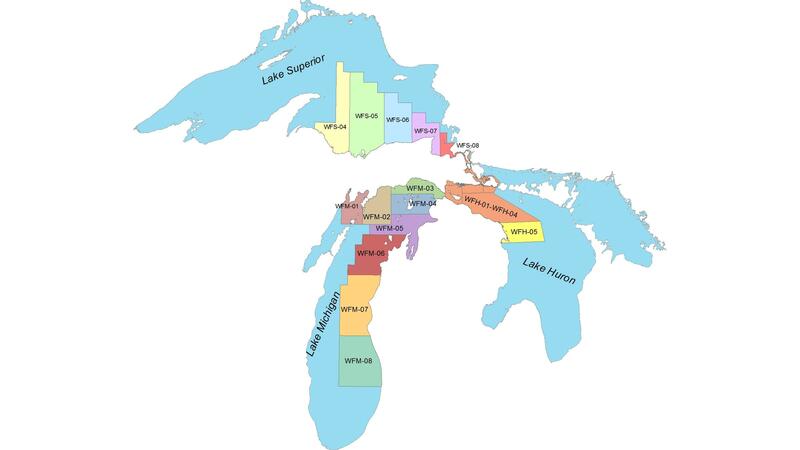 Whitefish management units in the 1836 Treaty Waters of Lakes Michigan, Huron and Superior. Indigenous tribes and the Michigan Department of Natural Resources work together to monitor and manage the fishery. The data suggests that more whitefish than usual were harvested in eastern Lake Superior in the last few years. A group of fishermen gathered in the Bay Mills Tribal Center all tell similar stories. The lower lakes were good – until they weren’t – and then there was an exodus. Don Tadgerson, who’s been fishing on Lake Superior for decades, says he has definitely noticed the extra boats. Despite the inconvenience, Tadgerson knows his fellow fishermen don’t have a choice. “It is a tribal right, so come on up and join the crowd,” he says. Jacques LeBlanc Jr., a third generation fisherman, chimes in from across the table. 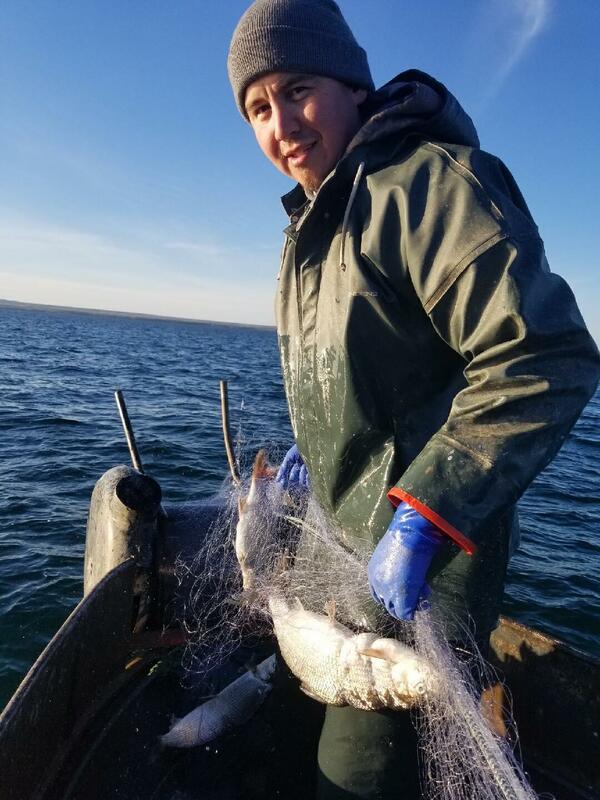 LeBlanc Jr. says the extra pressure on Lake Superior whitefish keeps him up most nights. He’s one of the youngest fishermen in the tribe and has three sons. “I come from a fishing family, and it's also something I want to be able to pass down to my children,” LeBlanc Jr. says. Biologist Paul Ripple says commercial fishing affects every family on the reservation in some way, whether it’s their primary income, a side job, or a dietary staple. But it’s unclear what the impact of more fishermen in Lake Superior will be. For now, the tribes and the state are closely watching whitefish populations. “I’m not panicked yet, you know, we’re not in panic mode, but we are certainly in ‘concerned’ zone,” says Ripple. Bay Mills and other tribes that fish the area set harvest limits for their members. They can adjust those limits to protect fish populations, and Ripple says they’ll see if that is necessary. The rules for commercial fishing in Michigan are being rewritten in Lansing. The law is old and needs to be updated. There are only 21 non-tribal businesses licensed by the state to catch fish for market. Tribes fish under their own rules.